Rivers are often damned by damming. Lakes are often made by dams. But sometimes lakes are damned by dams. And somehow these sentences relate to the title of today's post, which bears a similarity to yesterday's post about Topaz Lake. But the issues of today's post are strikingly serious and relate to the choices we make in our use of natural resources. When does a lake die? I know that lakes aren't alive, but at what point does a lake no longer exist as an ecosystem that supports life? The answer to a question like this has multiple layers and complexities. There are many different answers. The Dead Sea in Israel/Jordan is the saltiest inland sea on the planet and nothing more complex than bacteria can survive in its waters. It is about as dead as a lake can get short of drying completely. Oil spills notwithstanding, the disappearance of the Aral Sea in four short decades (due to water diversions primarily for growing cotton) is considered one of the great environmental disasters of our times. What these lakes have in common is that they are terminus lakes. "Terminus" refers not to the fact that they are 'dead', but that these lakes have no outlets, and the only way for water to leave the system is by evaporation. Such lakes have unique environmental problems whether humans are involved or not. There are several terminus lakes in the Basin and Range Province of the American West. 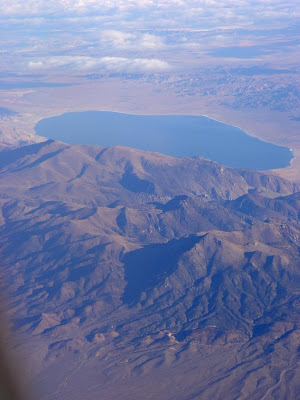 Some of the lakes are famous, for instance, Great Salt Lake and Mono Lake. A few are less familiar, and are the subject of today's post. During the Ice Ages, vast amounts of glacial meltwater flowed into the Basin and Range Province, and except for a very few brief connections to ocean-bound rivers, never flowed out. The fault valleys filled with water, forming pluvial lakes. 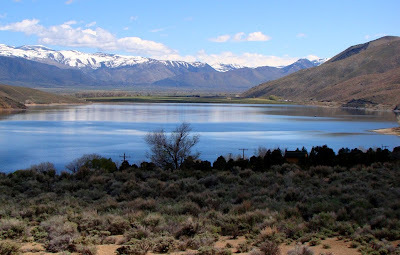 The biggest, Bonneville Lake, covered much of western Utah, some 10 times the area of present-day Great Salt Lake. Lake Manly filled Death Valley to a depth of 600 feet or more, and was 125 miles long. 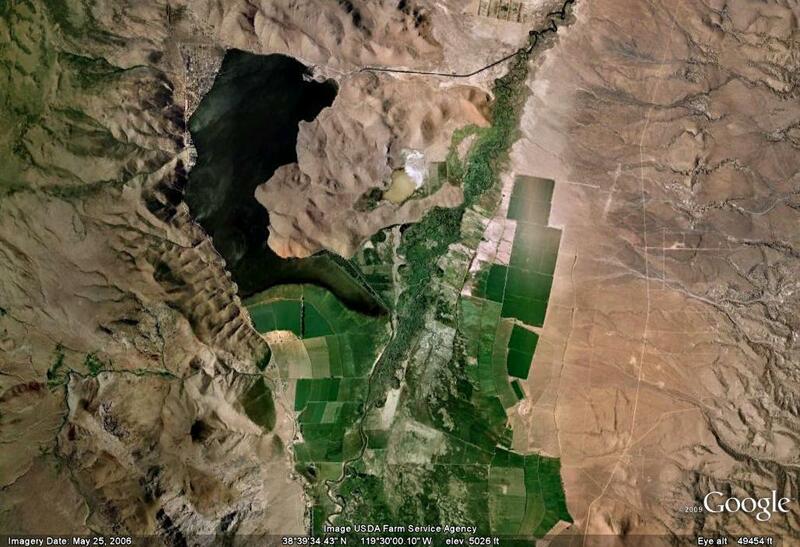 Possibly the least known lake was Lahontan, which covered a vast area of northwestern Nevada (see the map below). 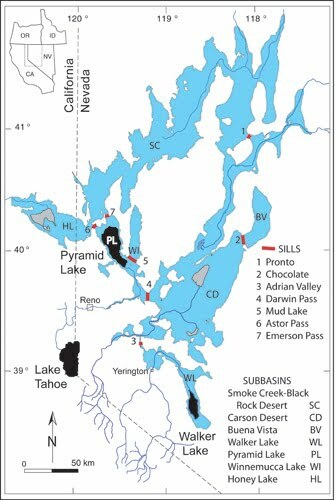 When Lahontan began drying up at the end of the last ice age about 13,000 years ago, just two river systems were big enough to support permanent lakes, the Truckee out of Lake Tahoe, and the Walker River out of the Sonora Pass region. 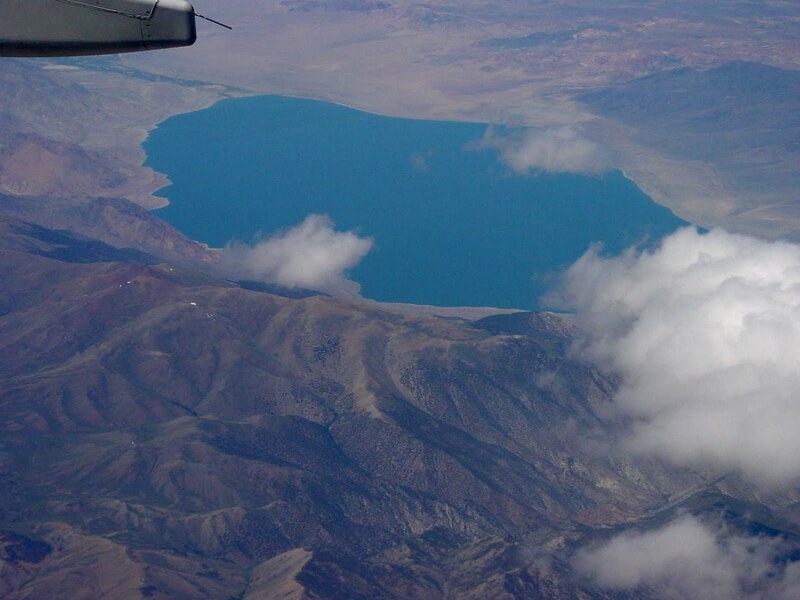 The Truckee supplies Pyramid Lake, while the Walker supports Walker Lake, near Hawthorne, Nevada. Water is, and will always be a contentious issue in the arid western states. If water flows, somebody will have a use for it, and usually there are many somebodies, and the total use of the water will almost always exceed the average yearly flow of the river. Upstream users usually get first dibs to the water rights, and anyone sits at the end of the stream or river is lucky to get any leftovers. Such is the case with the Walker River and Walker Lake. 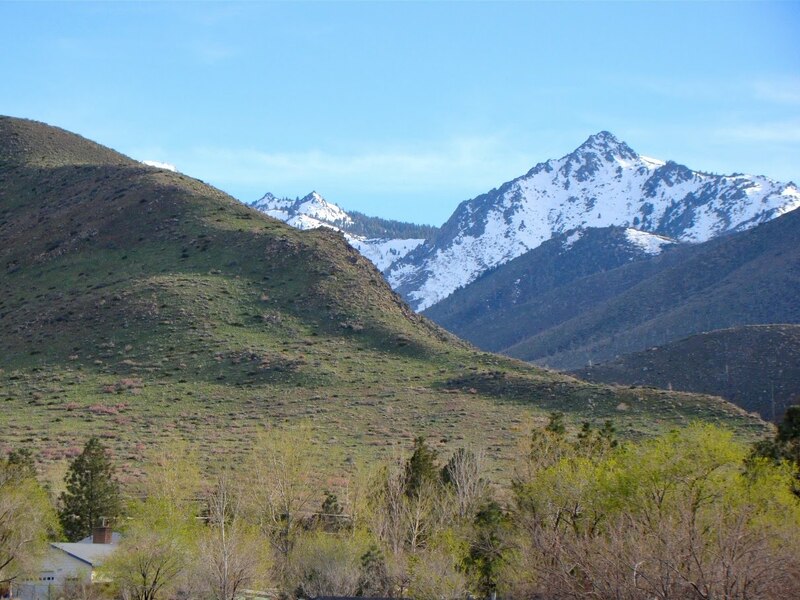 As outlined in several of the preceding posts, the West Walker River (and an equally interesting East Walker River) flows from the alpine mountains, through practically inaccessible gorges, and then across a series of wide and deep fault basins filled with sediment and fertile soils. The first Europeans to explore the region were after gold and silver. Hot on the heels of the miners came the pioneering ranchers and farmers, and lands were tilled in the Antelope, Smith and Mason valleys (see the USGS land-use map in the diagram below; full-scale map available here). 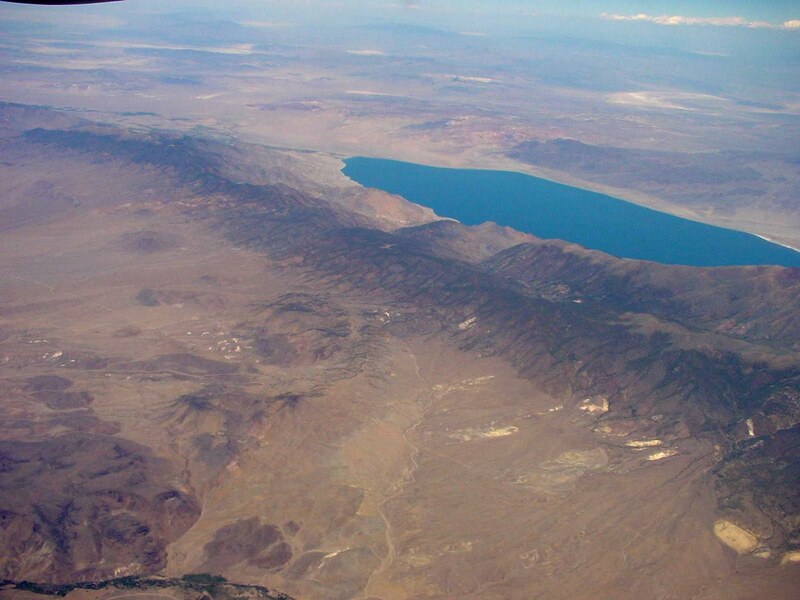 Walker Lake, near Hawthorne, Nevada, was the end of the channel for the Walker River. So much water was diverted for agriculture that the lake level began dropping immediately, from an elevation of 4,083 feet in 1872 to 3,930 feet today. This represents a drop in volume from nearly 9 million acre-feet in 1872, to about 1.5 million acre-feet today. Total dissolved solids (TDS) in the lake increased from 2,500 parts per million in 1882 to about 16,775 ppm today, mostly in the form of salt (seawater has about 35,000 ppm). The lake that remains is 12 miles long, 5 miles wide, and only about 78 feet deep. 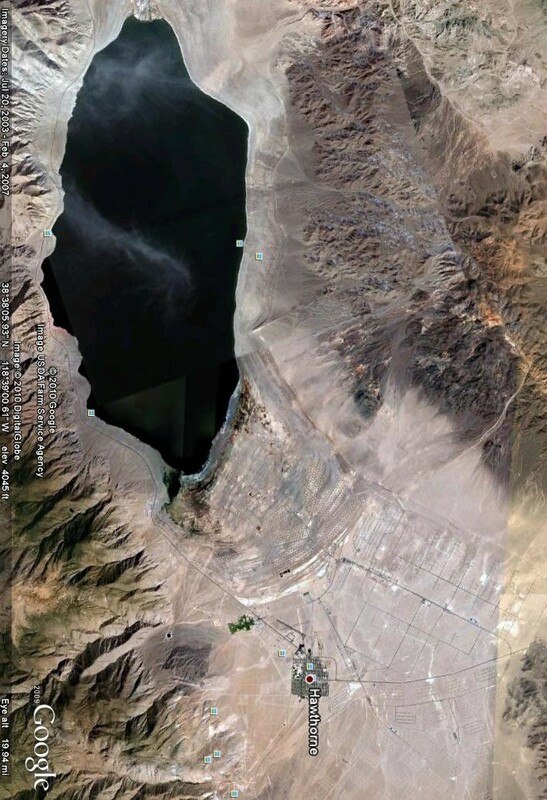 So, why worry about a 'dead' terminus lake in the middle of the desert? It's just that it wasn't, and isn't yet dead. There were four native species of fish living in the lake when settlement began: the Lahontan cutthroat trout (Oncorhynchus clarki henshawi), tui chub (Gila bicolor), speckled dace (Rhinichthys osculus), and Tahoe sucker (Catostomus tahoensis). Other species were introduced later on and thrived at first. Today, only one native species still survives in the lake waters, the tui chub, but it's continued success at reproduction is now in doubt. The original race of Lahontan cutthroat trout disappeared, but a different population was reintroduced, and is hanging on for now. These fish, and the various forms of algae, diatoms, and insects in the lake are the basis of a complex food chain that includes thousands upon thousands of local and migratory birds. Mono Lake, with a much higher concentration of salt, hosts a food chain as well, but it involves only brine shrimp and brine flies to feed the birds, because nothing else can survive the waters. Walker Lake is a far more diverse system, but that diversity is ever more threatened. Terminus lakes like Walker are highly sensitive to climate change. During the ice ages, the lake was a part of a huge freshwater lake that stretched across northwest Nevada. At other times the lake dried or nearly dried up with TDS much higher than seawater. 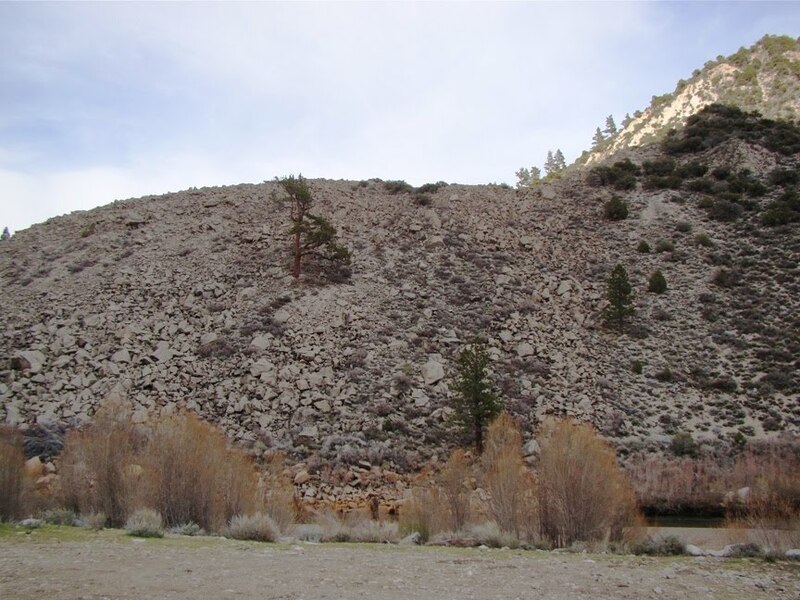 The ecosystem of the lake responded to those changes, and when fresh water dominated, fish and other creatures would re-colonize the lake from their refugia in the Walker River or in freshwater springs within the lake. What has changed during the human history of the lake is the introduction of contaminants from mining or agricultural runoff, and the rapidity of the dessication of the lake. 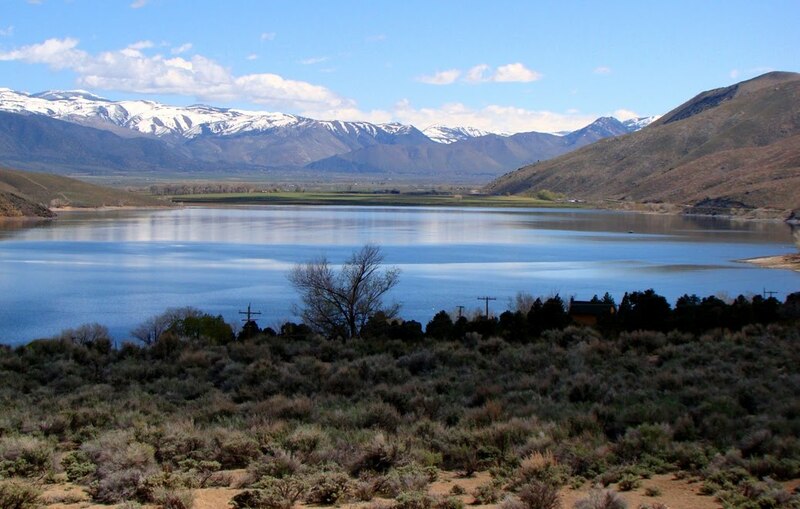 Efforts are beginning to try and stabilize the situation at Walker Lake, mostly in the form of purchasing water rights from upstream users to increase the flow of fresh water in the downstream parts of the river. You can find out more here. 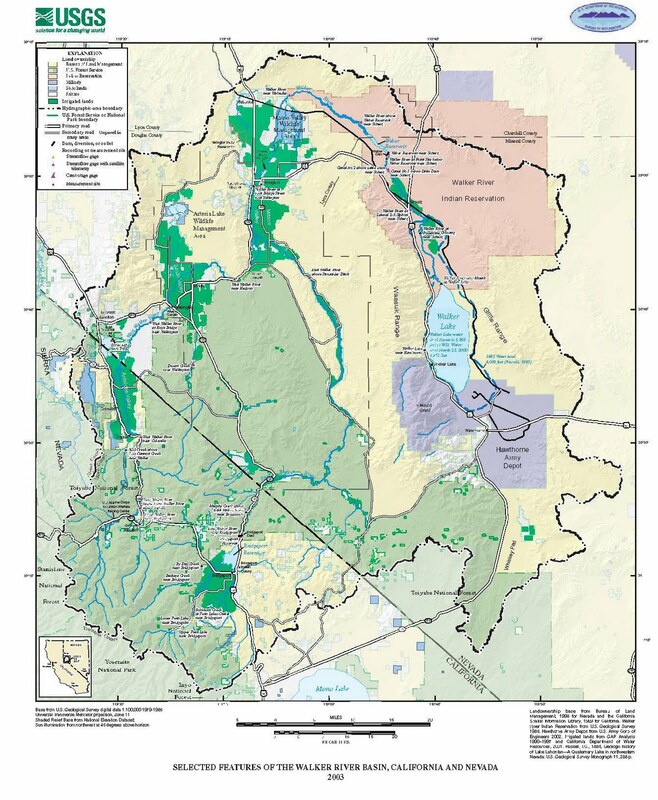 A detailed analysis of the ecosystems of the entire Walker River system can be seen here. If I were a TV reporter, I would be closing this post with the words "Time will tell". But it doesn't seem that there is a whole lot of time. One last, and totally unrelated note. If you look closely at the Google Earth image above at the terrain around the town of Hawthorne, you can see a network of roads and widely spaced buildings. It's an eerie place to visit, especially if you are a child of the Cold War era. The buildings are ammunition bunkers, widely spaced so that an atomic bomb couldn't destroy them all at once. The first time I visited, I felt like I was at the center of a giant bullseye target. The Other California: Dammed if we do dam, dammed if we don't dam! I thank my father for the title, which derives from a college term paper he wrote many years ago, although today's post is about a different place, Topaz Lake, on the border of California and Nevada just east of the Sierra Nevada province. It lies at the north end of Antelope Valley, which I explored in the previous post in my series on the "Other California". I also thought of calling this post "A River Runs Through It (but not exactly)". 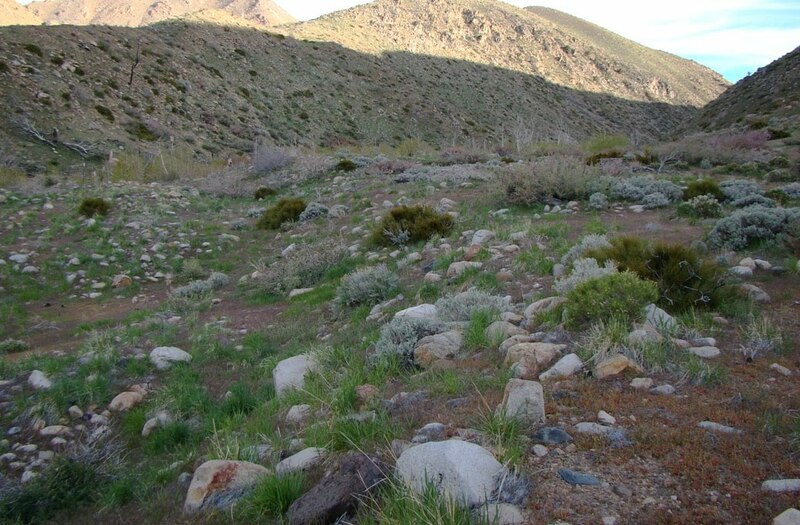 Antelope Valley is a half graben, a valley formed as movements dropped the valley along a curving fault surface, forcing the West Walker River to flow along the mountain front. The fault system becomes complicated at the north end of the valley and some low peaks, the Gray Hills, interrupt the otherwise flat topography of the valley floor. 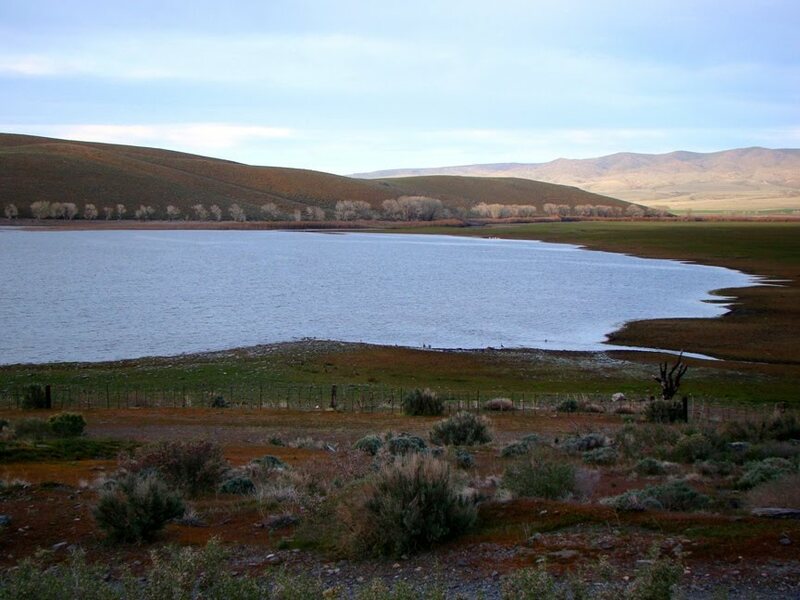 Prior to 1921, the basin between the Gray Hills and the Sierra was occupied by a dry lake bed called Alkali Lake (or Rickey Lake). The West Walker River was blocked from flowing into the lake by the alluvial fan that had built out from Slinkard Creek (at the bottom of the GoogleEarth photo). 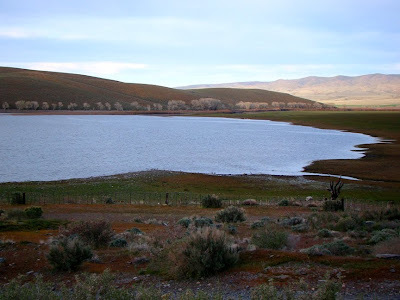 Early ranchers in the region, especially the owners of the vast Rickey Ranch, wanted better control of the water for irrigation purposes, and devised a scheme to divert the West Walker into Alkali Lake for storage. Their plans precipitated a water war with other ranchers, especially California cattle baron Henry Miller downstream and the litigation eventually reached the Supreme Court. 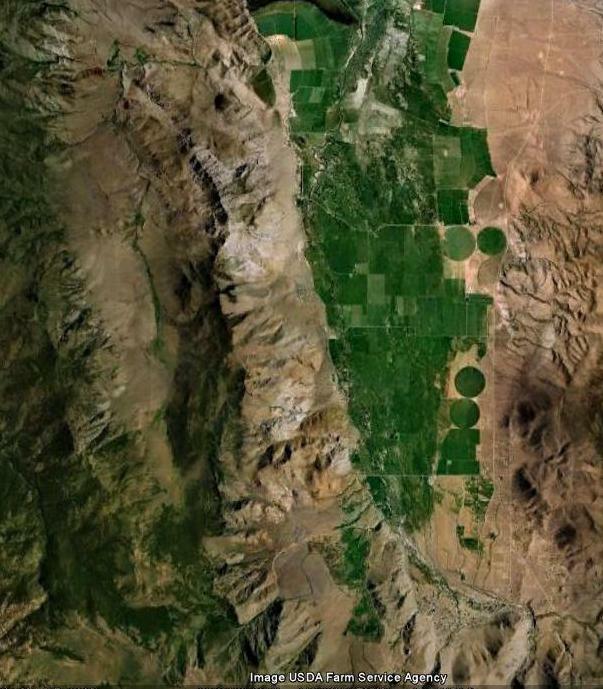 The Rickey Ranch lost, but ironically the other ranches decided he had a great idea, and a levee was built to divert the river into the dry lake bed. A tunnel was built at a low point in the Gray Hills to control the water level. 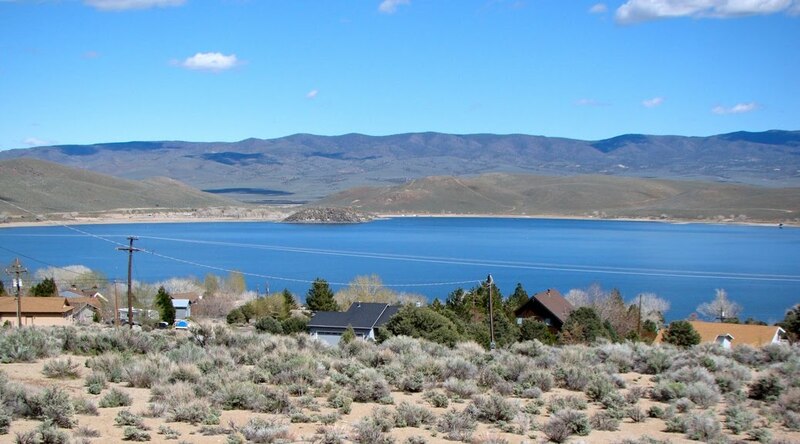 So, Topaz Lake is a reservoir without a dam! The reservoir has about 65,000 acre feet of "dead water" and about 59,000 acre feet of usable storage space. The outlet tunnel is at the low point in the hills on the far side of the lake in the picture below. The flood of 1997 keeps coming up in my recent posts. It was an extraordinary event in which the river peaked at almost double the size of all previous floods, at 12,000 cubic feet per second. This flood, and an earlier smaller event in 1986 revealed a serious weakness of the reservoir system. Because of channel blockages below the diversion, there was no way to stop floodwaters, and especially debris from flowing into the lake, causing the lake to rise far above normal levees, and flooding some residential areas. Modifications to the levee system are currently being made (the inlet canal is marked by the line of Cottonwood trees in the picture below). 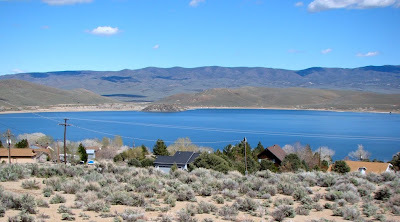 Topaz Lake today is fishing destination, and if you are one of those really desperate gambling junkies, it has one of those casinos that sits almost on the state boundary with Nevada. It also has some nice views of the mountains, and now that you know what you are looking for, it is a wonderful place to see the results of some heavy duty fault action. One more post to go on the West Walker River series. The next post will involve the end of the river in Nevada, but the repercussions extend into our fair state of California. The West Walker River, the latest entry in our "Other California" series, changes character many times on its journey from the headwaters in the High Sierra to the end of the river in the desert at Walker Lake in Nevada. 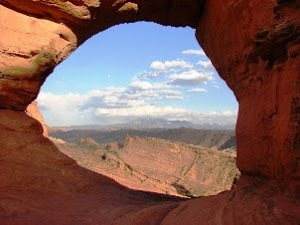 It begins as a glacially carved valley, plunges into a deep river-cut gorge, and then it flows out into a wide open alluvial plain, the Antelope Valley. Unlike the erosion that is taking place upstream, this is a place where the river deposits material. In other words, Antelope Valley was not carved by a river at all. As can be seen in the GoogleEarth image below, the use of the river changes as well: upstream is protected watershed and recreation/wilderness country, but the Antelope Valley is given over to agricultural development. Notice in the image above how asymmetrical the valley is: on the left (west) it has a sharp boundary with the mountain flank; on the right (east), the valley slopes gradually up into the foothills of the Sweetwater Mountains. It is the expected shape of a fault-formed valley, a graben (really a half-graben, since the major faults are on one side, the left). 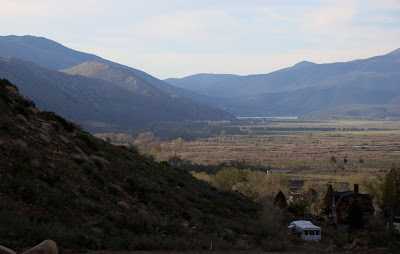 Antelope Valley sits astride the boundary of the Sierra Nevada and Basin and Range provinces, where the solid block of the Sierra is being sliced up into a series of fault-bounded grabens. 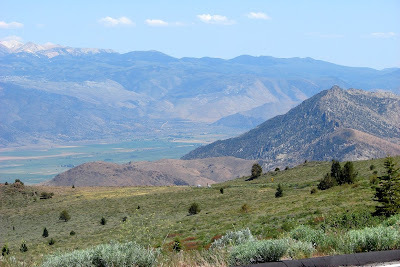 The picture below shows the upper (southern) end of the valley from Monitor Pass, with the Sweetwater Mountains in the distance. Upon hearing that this is a fault valley, most people might ask if the faults are still active. In a word, yes. Besides the youthful appearance of the mountain front (look at the sharp slope break in the photo below where the valley is sliding down relative to the mountain slope), the river has been forced to flow mostly on the west side of the valley, where the valley has dropped the most. The break in slope is where one would look for evidence of recent earthquakes, but slopewash has covered the fault terraces (scarps) in most places. Except for the streams and alluvial fans that cross the fault trace. That was what I was searching for when I was doing my masters thesis many years ago in this valley. I was very pleased when I found some. The person who did the original mapping in the 1950's was working primarily on the rock exposures, and wasn't really looking for recently active faults. By the 1980's a number of people were looking a lot harder, trying to determine the seismic hazard for the region. Fresh alluvial fans provide a possibility of dating the occurrence and size of the last earthquake to cause ground rupture in an area. 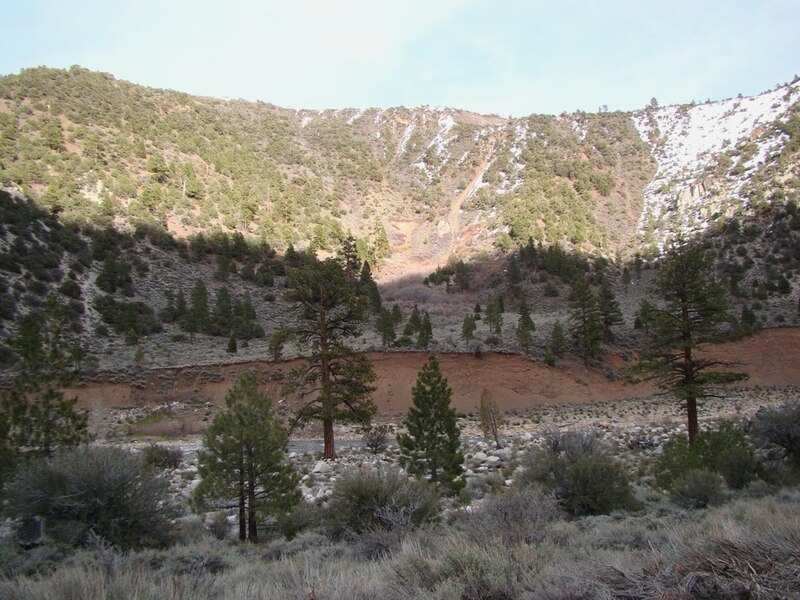 The picture below is the Mill Creek fan, at the extreme south end of Antelope Valley. Under normal circumstances, an alluvial fan should be a smooth, gently sloping surface. Here at Mill Creek, the surface steps down to the left, forming a terrace. Immediately after the earthquake this terrace may have been essentially vertical, much like the scarps formed in April in Baja California (examples of scarps are shown on this post from last month - Slinkard Valley lies immediately west of Antelope, and the post has a nice cut-away showing the arrangement of the fault blocks). Scarps like these show that the last major earthquake took place in the recent geologic past, very likely less than 10,000 years ago, and maybe as recently as 3,000 years ago (the latest incarnation of the state fault hazard map is in agreement). The length of the fault and the size of the scarps are characteristic of quakes in the range of magnitude 6.5-7.0 (USGS analysis is here). A magnitude 5.8 event, the Double Springs Flat earthquake, shook the extreme north end of the Antelope Valley fault system in 1994. Earthquakes are not the only hazards associated with the Antelope Valley. I had a personal experience with the massive flood of 1997 that I chronicled in a post last year. The flood was twice the size of the previous record flood, and resulted in a new channel being formed. The Army Corps of Engineers put the river back after a few weeks. I have video of the event, which I hope to find and post as soon as I can. 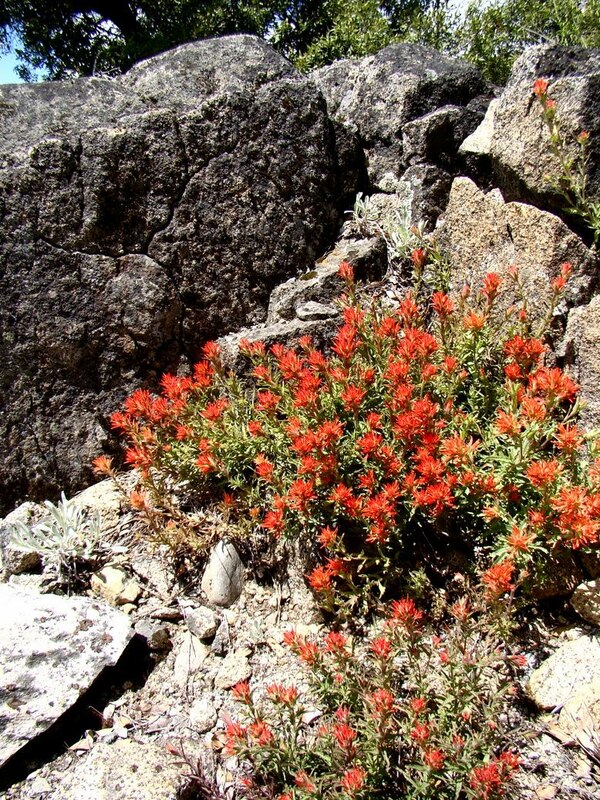 If you visit the Antelope Valley in the fall, you may have a unique and increasingly rare experience. The very first time I saw the valley, in 1976, I was on my second geology field trip. We were in a hurry to get somewhere, and we rolled into the valley at a high rate of speed, only to be brought to a complete stop by a ... stampede. Well, ok, to us flatlanders it was a stampede. It was actually a very large herd of cattle being directed down onto the valley floor to spend the winter after fattening up in the adjacent high country. Oh, and I must say that the 100-year-old Cottonwood trees along the highway at Coleville and Topaz have a wonderful blazing yellow glow when the weather is turning cold and the leaves are turning. Just Curious: Specialized Vehicles for Teaching in the Field? 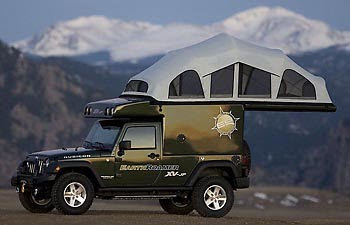 I'm thinking of shooting the moon and applying for a grant to purchase a rolling laboratory for field trips, and I'm having a hard time choosing which way to go with this. It's pie-in-the-sky in all likelihood, but what would you do if you could design a vehicle to enhance teaching of earth science in the field? I'm thinking of a utility vehicle or even a small van-sized RV that could handle fairly tough road conditions (gravel roads at least) that is outfitted with a satellite link and wi-fi router that could provide internet access in isolated campsites, as well as a printer and scanner. We've thought of the most rudimentary RV type of vehicle because a toilet and inside or outside shower can be a godsend in some circumstances (like when someone gets sick). Fridge and small stove maybe. 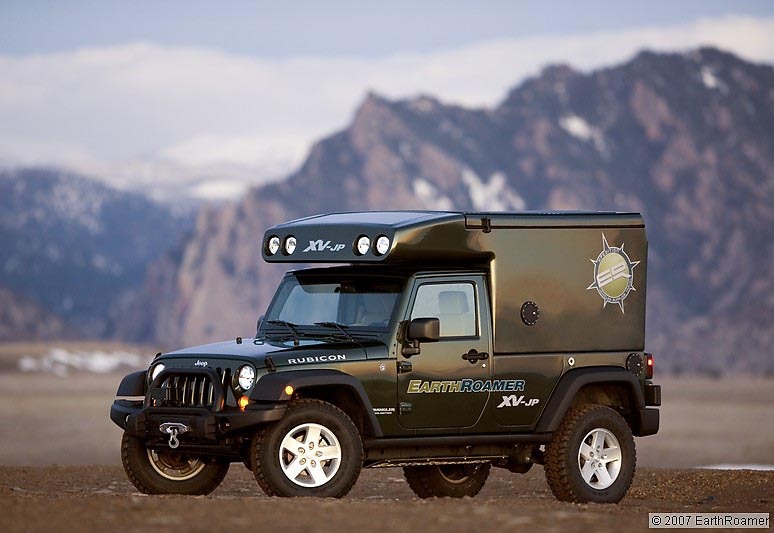 One very expensive option is a Jeep-based unit from a Colorado company that is an absolutely stripped RV (fridge, bath, shower and queen-sized bed...really!) that can go on literally any road. I like that the electricity is provided by the engine and a roof-mounted solar array. It gets reasonably good mileage, too. Made by special order. And very expensive. Did I say that already? On the other hand, Roadtrek offers a complete (and very comfy, but you didn't read that) RV that is packed into a van chassis that is no longer or wider than an 8 passenger van. It has all the stuff already listed plus a lot more storage space. But I look at it and think, "wow, six students could work at once on projects on their computers and desk surfaces!" but I have this uncomfortable feeling that a grant evaluator would think "this professor wants a nice place to sleep" (not true, I like sleeping under the stars). This option is actually about $30,000 cheaper than the Jeep. These might be over the top, so perhaps a truck with utility cabinets, camper shell and an electronic array under the seats in the cab? No place to work, no printers, etc., but a lot cheaper. Does anyone have anything like this? Have you ever thought about it and what you could do with such a resource? I would love some feedback about the teaching possibilities of something like this. For those who are new to Geotripper, I teach geology at a community college, and usually deal with introductory-level geology students. Rivers used to be such simple things. I learned it in third grade. Water evaporated out of the ocean, fell on the mountains as rain or snow, and carved a canyon on the way to the sea. And then I found out it wasn't quite that straightforward. With a few exceptions (like rapidly growing volcanoes), mountains don't suddenly appear and then start eroding. Erosion is going on all the time the mountains are rising. And then one finds that few rivers are simple: they do strange things sometimes, like flowing right through mountain ranges. Or changing directions in illogical ways. Lots of rivers in my corner of the world just end, in the middle of the desert, or on the floor of my Central Valley. Some, especially in limestone country, disappear unexpectedly and then reappear somewhere else. And so it is with one of my favorite rivers, the West Walker in the Eastern Sierra Nevada. I started my brief exploration last time at the headwaters of the river, where the glaciers had sculpted the river canyon. The valley was wide and open and the river meandered across open meadows for the most part. But near the junction of Highways 108 and 395, the character of the canyon abruptly changes. It plunges into a deep declivity, and in the next 12 miles it quite literally cuts through a mountain. It then flows into the wide fault graben of Antelope Valley and eventually crosses two more mountain ranges in Nevada before ending in the salty waters of Walker Lake. How can a river cross a mountain range? There are several ways: the river may have been present before the mountain range, and as the mountain range rose, the river cut downwards, keeping up (down?) with the uplift (an antecedent stream). 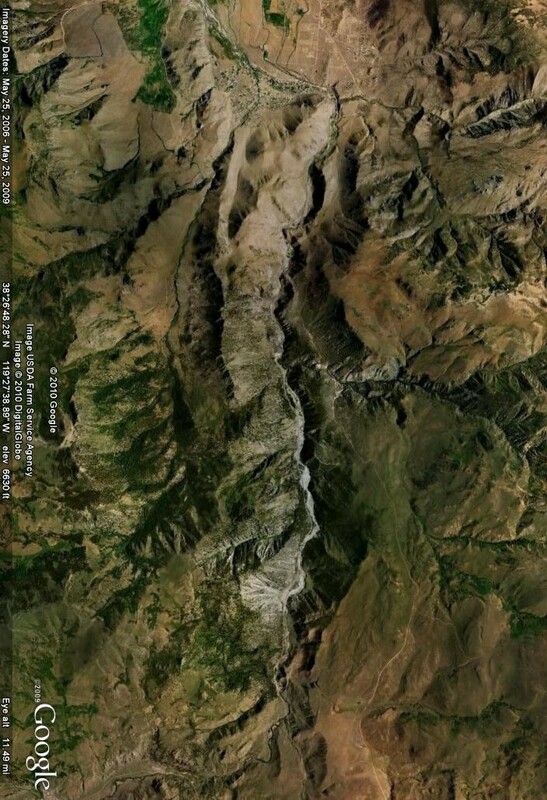 Or the mountains were originally buried under sediment, and a river flowing across the sediment quarried it away, exposing the mountains underneath (a superposed stream). One river can cut into a mountain range by way of headward erosion, eventually breaching the range and capturing a river on the other side (stream piracy). Or something exotic, like the river flowing under the mountain through caverns, where the caverns eventually grew and collapsed, forming a valley (sounds weird, but each of the last two have been seriously suggested as an origin for the Grand Canyon). So what happened to form the West Walker River gorge between Sonora Junction and Antelope Valley? It is a geologically young valley compared to the relatively gentle erosional surfaces that surround it. There are odd abandoned drainages here and there, and pirated stream channels. The orientation of the river seems most strongly influenced by both glacial activity and fault movements. 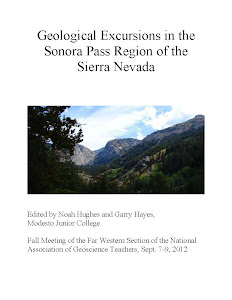 Faults in the region have a strong north-south orientation and recent activity is clearly indicated by late Pleistocene or Holocene scarps at Sonora Junction and Antelope Valley at either end of the gorge. Any possible recent activity in the gorge itself has been obscured by erosion and slope wash, so the precise role of faulting is difficult to discern. The west canyon wall is generally higher than the east wall, so faulting very well may have guided the location of the river. 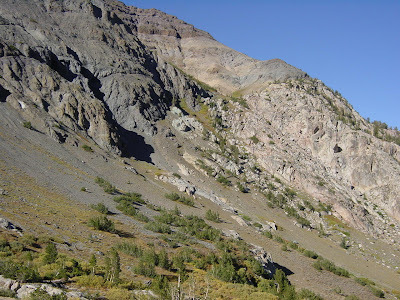 The most recent glaciations (the Tahoe and Tioga) did not reach into the gorge, but the much older (~800,000 years BP) Sherwin glacier flowed the entire length of the canyon, leaving a train of erratic boulders as much as 1,200 feet above the present-day river. Glaciers certainly have a penchant for changing the orientations of rivers, and that probably happened here, but the present channel does not have any of the usual features of glaciers that could pinpoint the precise location of the glacial pathway, as vigorous downcutting in the last 800,000 years has removed any direct signs of the passage of ice in the inner canyon. Just the boulders on the canyon rim. Whatever the origin of the gorge, the constriction of the river in this narrow and deep v-shaped canyon has geologically hazardous consequences for those who live and travel in the area. The only place for a highway is right next to the river, and there really isn't room for both of them. In 1997, a flood of catastrophic proportions removed most of the highway, and reshaped the canyon walls in many places. Rockfalls are common, and a few immense rockslides are present at several locations. A number of disastrous wildfires in recent years have led to mudflows. And the fact that much of the canyon is continuously in shadow means that black ice can linger on the road surface far longer in winter than on other parts of the highway. Even in dry conditions, the sharp curves lead to accidents. A bus rolled over here in 1987, killing 21 passengers. On the other hand, the gorge is spectacular, and has many interesting mysteries. There are campgrounds, picnic areas and some really great fishing holes as well. Check it out! The "Other California" is a continuing series about the less familiar places in our state with interesting geology. 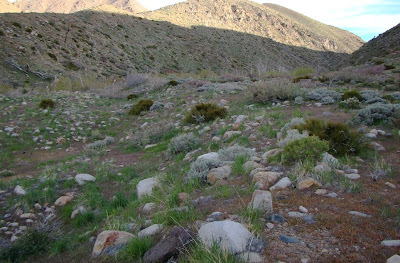 Our next post will be on the Antelope Valley, the downstream end of the West Walker in California. Blackwelder, E., 1931, Pleistocene glaciations of the Sierra Nevada and Basin Ranges: Geological Society of America Bulletin, volume 42, pages 865-922. Clark, M. M., 1967 Pleistocene glaciation of the drainage of the West Walker River, Sierra Nevada, California: Ph.D. Thesis, Stanford University, Stanford, CA, 170 pages. Halsey, J. G., 1953, Geology of parts of the. 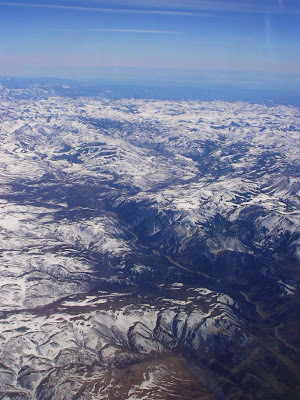 Bridgeport, California and Wellington,. Nevada quadrangles (Ph.D. dissert.) Berkeley, University of California. Ask most people their image of the Sierra, and you will hear about Yosemite Valley, Sequoia, granite, and the Mother Lode. Ask them about crossing the Sierra, and they may mention Tioga Pass or Donner Summit. 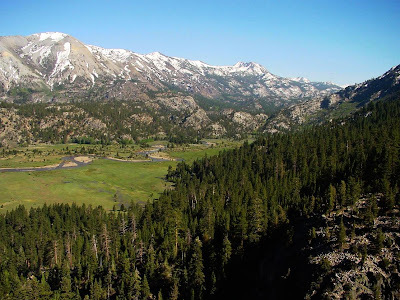 There is a lot more to the Sierra, and this week I am going to highlight some of those places. The "Other California" series is about these kinds of places, the lesser-known spots of geological interest. There are a total of four paved crossing of the Sierra Nevada between Yosemite's Tioga Pass and Donner Summit. Sonora Pass is crossed by Highway 108 out of Sonora and Pinecrest, and reaches an elevation of 9,624 feet, making it the second highest crossing of the range, just short of Tioga's 9,950 feet. The road drops into the drainage of one of California's little treasures, the West Walker River. 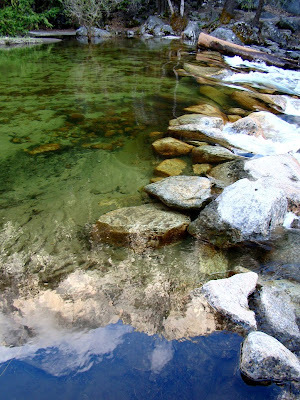 The West Walker is one of the longest rivers in the eastern Sierra Nevada. Most east-side rivers drop steeply and within a few miles disappear into the desert of the Owens Valley or Mono Basin. Because of a structural glitch in the range, the Walker runs mostly north through a relatively unbroken stretch of mountainous terrain before flowing into the Antelope and Smith Valleys in Nevada, and finally ending at Walker Lake, a bit more than 100 miles downstream. 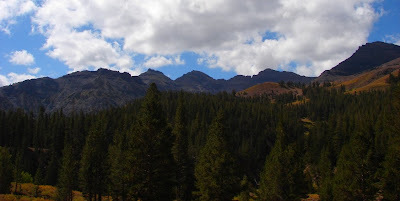 The upper reaches of the West Walker are a bit different than other parts of the Sierra Nevada. The mountains are not composed of granite, but instead are somber red and gray volcanic rocks extruded in Miocene time, around 14-6 million years ago. 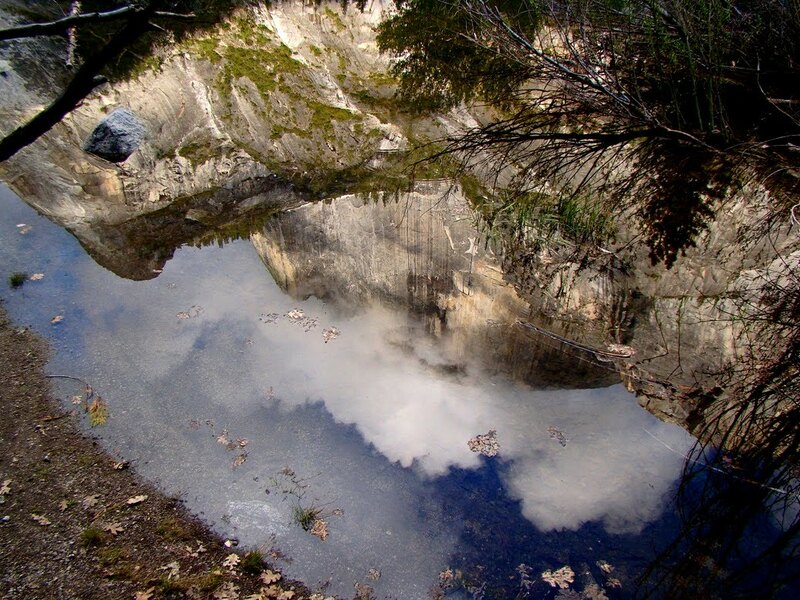 They are assigned to the Relief Peak formation and the Stanislaus Group. They were originally mapped in the 1950's (by my thesis advisor for one), and are the object of ongoing research today (see below for an example). Near the summit of Sonora Pass there is an interesting outcrop where the volcanic rocks lie in direct contact with the Sierra granites. There were canyons here that were filled when the volcanoes began erupting. Considering that granite forms several miles deep in the crust, that surface between volcanic and granitic rock represents the disappearance by way of erosion of perhaps four miles of rock between the late Mesozoic around 80 million years ago and the Miocene, about 14 million years. Evidence of glaciation abounds in the high country in and around Sonora Pass. 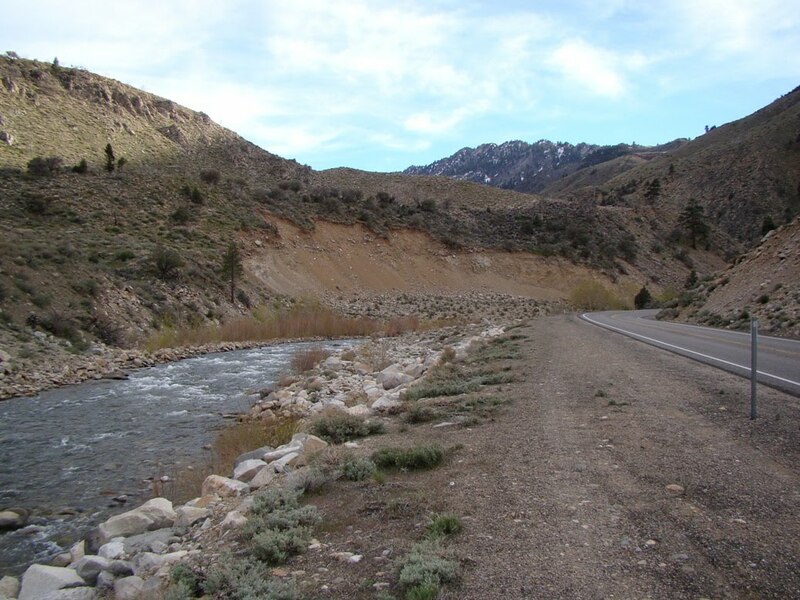 The West Walker River had the longest glaciers of any east-side canyon, with the longest reaching around 20 miles downstream. The Leavitt Valley, below, is a beautiful glacial trough. The main West Walker has its headwaters several miles above the point where the Highway 108 winds down a steep canyon wall. 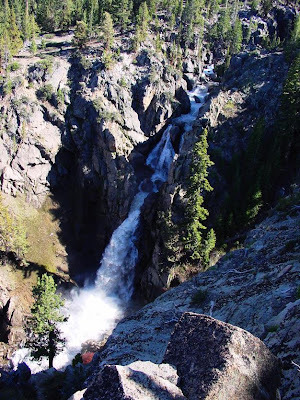 The smaller glacier coming from Sonora Pass could not carve as deep a valley as the main glacier, so it forms a hanging valley, with a pretty cascade called Leavitt Falls visible from a pullout. It's a good spot to stop and let your brakes cool off. As long as I mention brakes, the Sonora Pass highway is not for the faint of heart in its highest reaches. 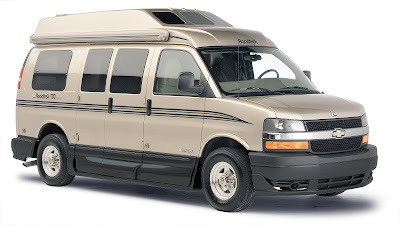 Most cars do just fine, but a big RV would be a nightmare, not just for the driver, but for everyone else who has to make their way around it. In other words, this is one of my favorite paved roads in the state! Highway 108 passes the Marine Base at Pickle Meadows and ends at Highway 395. At this point the river has a distinct change of personality, and that will be the subject of my next post. I spent the week blogging about a day at Yosemite National Park, and as usual I've tried to concentrate on some of the sights that people might otherwise miss. Of course a place like Yosemite Valley is famous for some iconic features that everyone photographs and even though I've been there perhaps 70 times or more, I still cannot resist taking them too. So today includes a few of shots of the familiar. 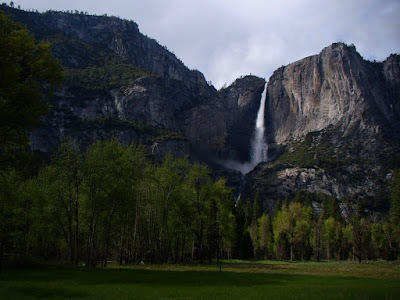 First of course is Yosemite Falls, in full glory of spring. The falls were booming across the valley, and they were beautiful. They constitute one of the tallest waterfalls in the world (somewhere around 5th to 7th place by most measures) with a total drop of 2,425 feet. 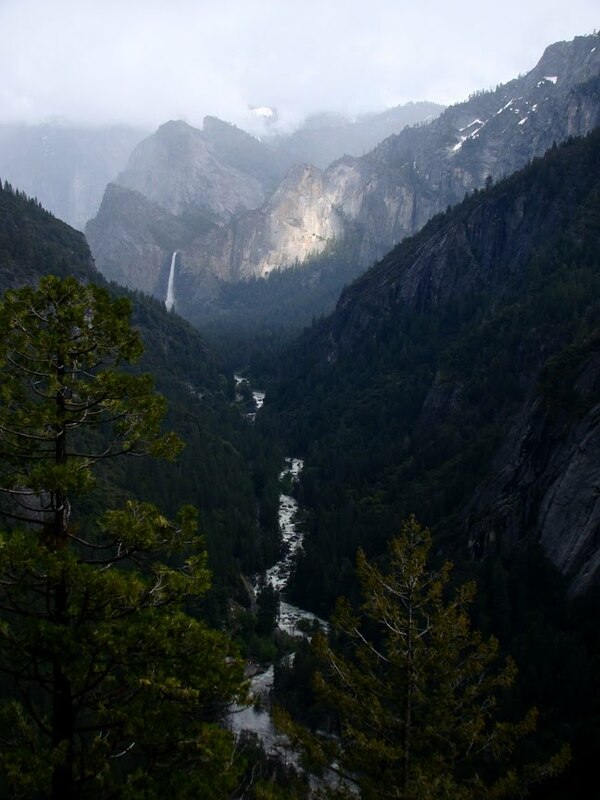 The falls are a fine example of a hanging valley, caused when the much larger Merced Glacier cut deeper than the smaller glacier of Yosemite Creek. Yosemite Falls were once much less interesting. The tree-filled cleft to the left of the Upper Falls was the original channel of Yosemite Creek and there was a steep cascade rather than a sheer drop. Some glacial debris (a moraine) along the top of the cliff blocked the channel, forcing the river over the cliff at the present site. The high approach to the valley from Big Oak Flat and Crane Flat includes some nice overlooks of the Merced River Valley and Bridalveil Fall along with the Cathedral Rocks and the Leaning Tower (the one sunlit cliff). Half Dome is visible from many places in the valley, but one of my favorites is the middle of the Curry Village parking lot! The only difficulty is a lone telephone wire crossing the lot that keeps getting in the picture. The clouds were playing hide-and-seek with the summit of the dome. 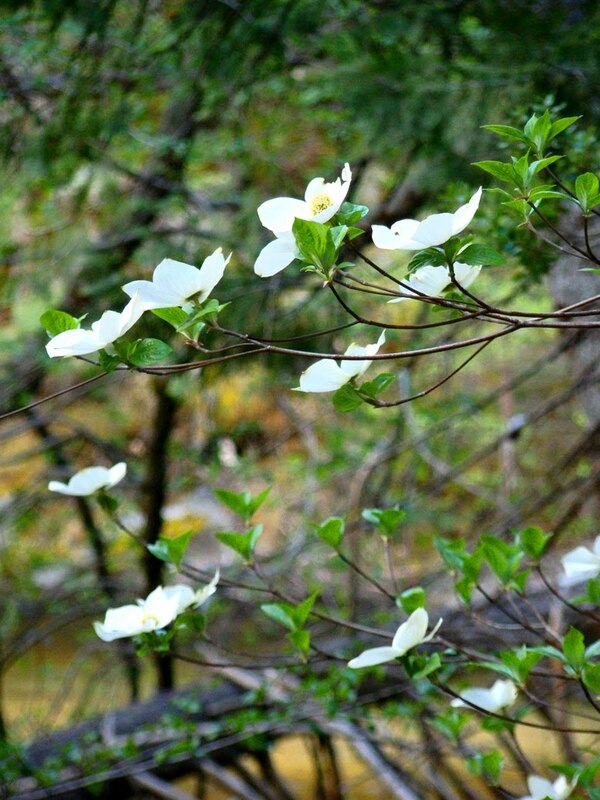 One of the attractions of visiting Yosemite in the late spring is the blooming of the Dogwood Trees, and they were a pretty sight as we meandered along the valley floor. 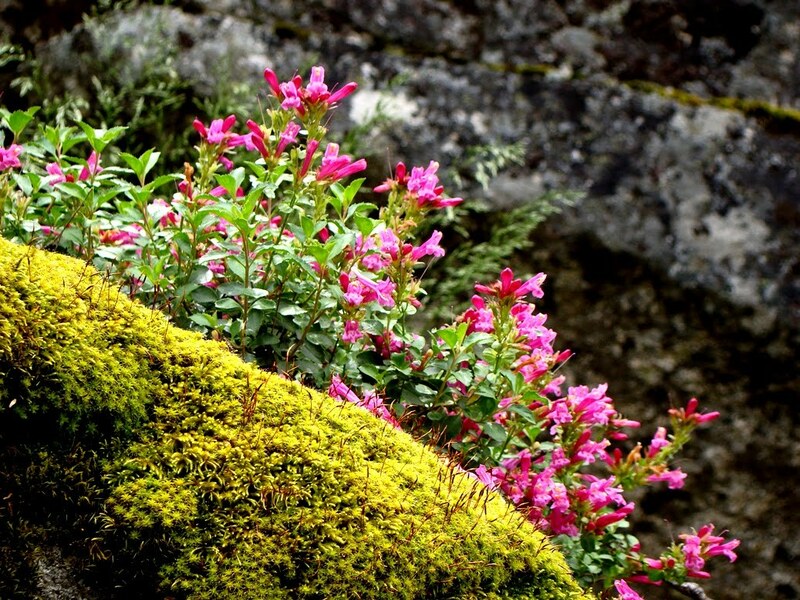 It's been a cool spring, so there's still time to catch some booming waterfalls and flowers if you get the chance! 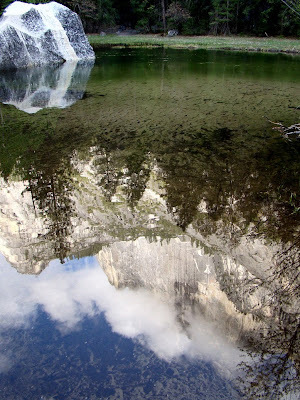 I really can't call today's post part of the "Other California" series because Mirror Lake is probably one of the most photographed spots in Yosemite Valley except for a couple of waterfalls and vertical cliffs. It is a rarer experience than the other iconic places in the valley because Tenaya Creek tends to dry up to a trickle and is not able to flood the area as effectively as it does in late spring, so many summer tourists never get to see it (I've seen many confused people searching for the lake in August). The most famous view of Mirror Lake is the angle that includes Mt. Watkins (made famous by Ansel Adams), but Half Dome looms directly above the lake, and makes for some memorable reflections as well. 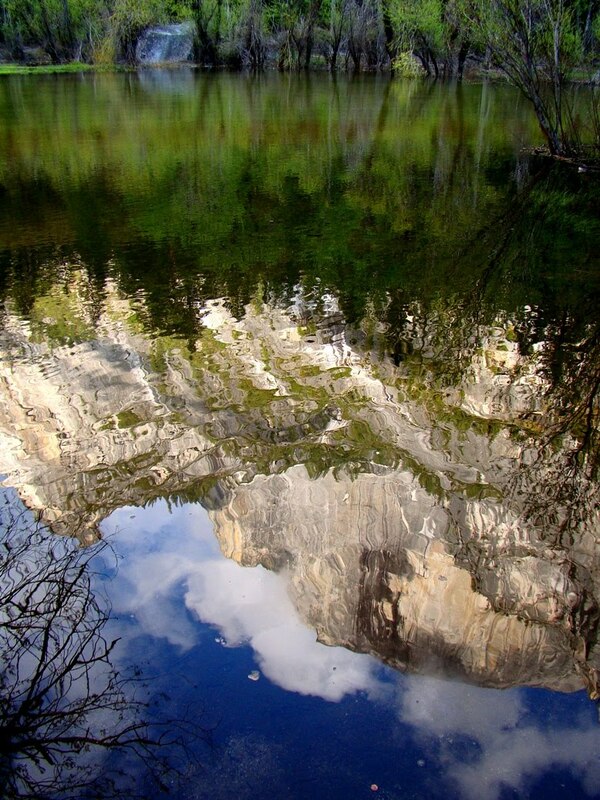 Mirror Lake is one of the most serene and quiet of the iconic places in Yosemite Valley because automobiles are restricted (only a few handicapped spots), so nearly all who visit get there on bicycles or on foot. One might be shocked to know that many of the famous corners of Yosemite Valley were once heavily used for other purposes. 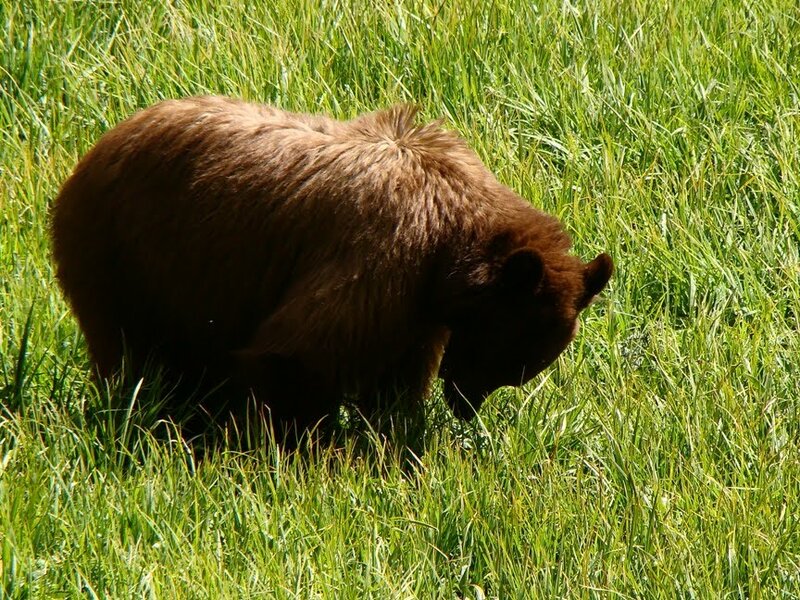 Some of the meadows were replanted with grasses better suited for cattle grazing so steaks could be served in the earliest hotels. Another meadow near the Ahwahnee Hotel was a golf course until 1981. Swampy areas of the valley floor were drained. And Mirror Lake was once utilized as a source of blocks of ice in the days before electric refrigeration. Because the lake was constantly filling with sand, the Park Service would quarry the sand and use it to spread on icy roads in the valley. The practice ended in 1971. One would expect that sands would fill the lake and it would eventually become another meadow, but the high spring runoff has a scouring effect that maintains a number of permanent pools (at least when the river is flowing). There is also a bouldery dam at the edge of the meadow (below). "The Indian name is commonly given as “Wai-ack”, meaning “water rock,” and was sometimes applied to Mt, Watkins too. Bancroft in his early guide book, and Hutchings, give the name “Ke-ko-too-yem” which they translate as meaning “sleeping waters”. From Yosemite Valley Place Names. Mirror Lake lies about 1 mile northeast of the road junction next to the moraine. Although it is called a lake, it earns that designation only during periods of highest river flow. 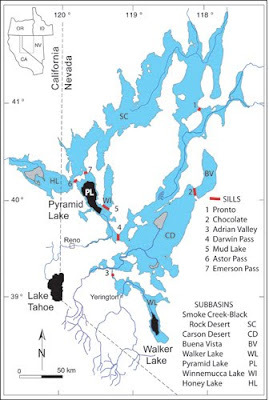 The lake formed behind a rockslide estimated at 11.4 million cubic meters, the largest slide so far identified in Yosemite National Park (Wieczorek et al., 1992). The "lake" has been rapidly filling with sand and gravel, and for years the National Park Service attempted to maintain the lake by dredging and by constructing small sediment catch-dams upstream (Ditton and McHenry, 1989). More recently, sediment has been allowed to flow into the lake, and although it is smaller than it once was, some ponding will always be present due to the scouring effect of spring runoff. Ditton, R.P., and McHenry, D.E., 1989, Yosemite Road Guide, Yosemite Association, 79 pages. Wieczorek, G.F., Snyder, J.B., Alger, C.S., and Isaacson, K.A., 1992, Rock Falls in Yosemite Valley, California, U.S. Geological Survey Open File Report 92-387, 186 pages. 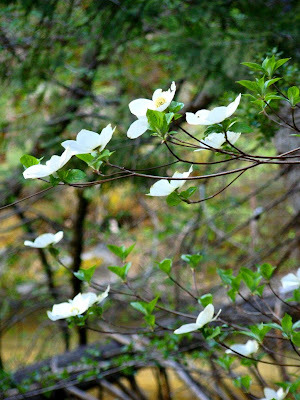 One thing I did not see a lot of in Yosemite Valley this last week was flowers, aside from the very pretty Dogwood blossoms. The valley floor is covered for the most part by thick forest and at this point flowers were either not blossoming yet, or they were shaded out by the forest canopy. Yosemite was once renowned for having more than 700 acres of meadows, but now there are fewer than 70 as fire prevention has allowed young trees to encroach. The situation was quite different at Hetch Hetchy. 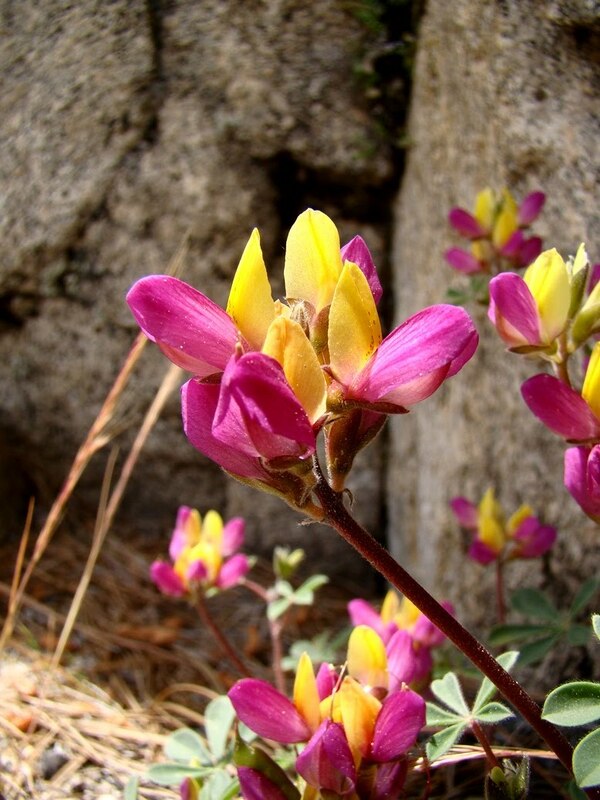 The forest is sparse, and the area receives a lot more sunshine, so the flowers were quite showy. 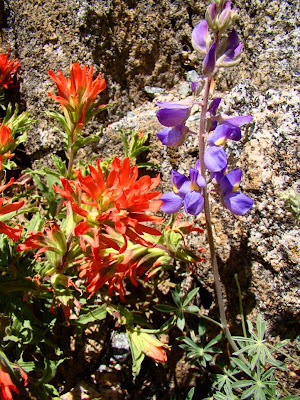 Indian Paintbrush and Lupine were quite common, including the Harlequin's Lupine (first photo), that I had not noticed before in my travels. 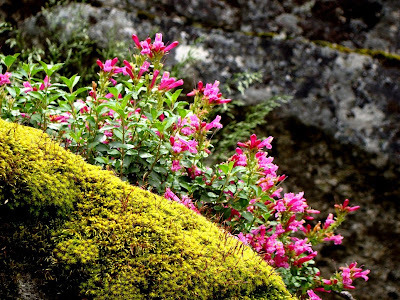 I know this is primarily a geology blog, but I couldn't resist posting a few flower pics, but the observant reader will notice that rocks play a prominent part in the framing of the plants! We also ran across something else on our trip: a Yellowstone-style traffic jam at Crane Flats. Yellowstone tourists are renowned for causing traffic jams wherever an elk or bison is encountered. We had a similar jam at Crane Flats. I knew that twenty cars and a ranger would never stop for a deer or squirrel, so we stopped too (contributing to the jam, I know), and saw a very nice little bear doing bear things in the meadow by the highway. It was good to see the bear totally ignoring the crowd, and concentrating on eating a natural food source instead of somebody's potato chips (ripped out of a car)! My Wednesday post asked where I took some pictures of some spectacular cliffs and waterfalls, noting that the place was a favorite of John Muir. 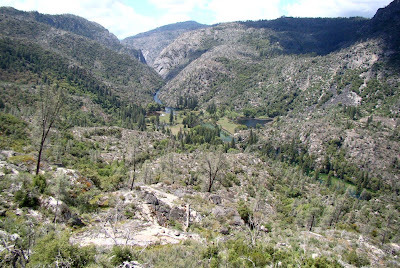 There are many wonderful gorges in the Sierra Nevada, including Kings Canyon (it was one of the guesses, and there is an important connection, but more on that in a moment). 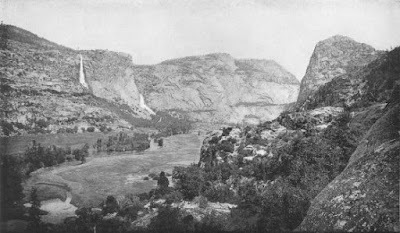 Many commenters recognized the cliffs of Hetch Hetchy Valley. What was missing from the pictures was Hetch Hetchy Reservoir. 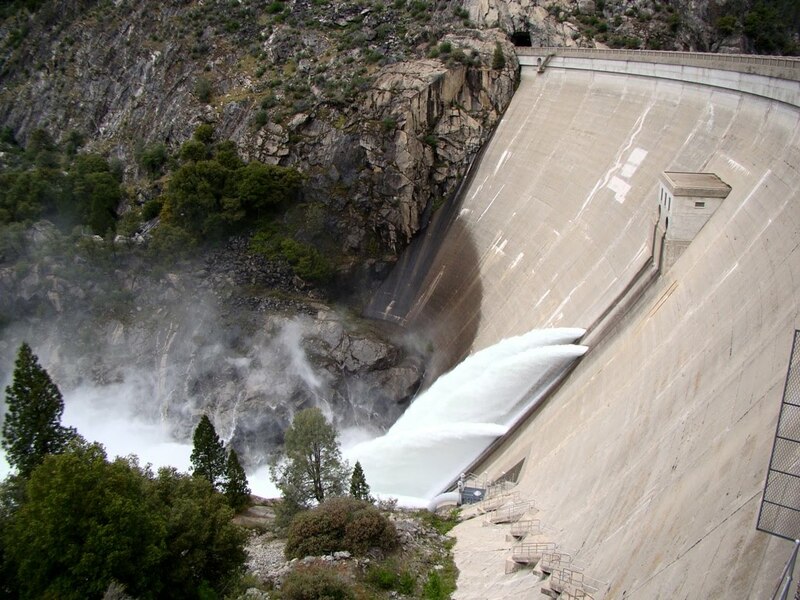 The valley and dam are part of Yosemite National Park. The bathtub ring of the lake is stark. A dam in a National Park? 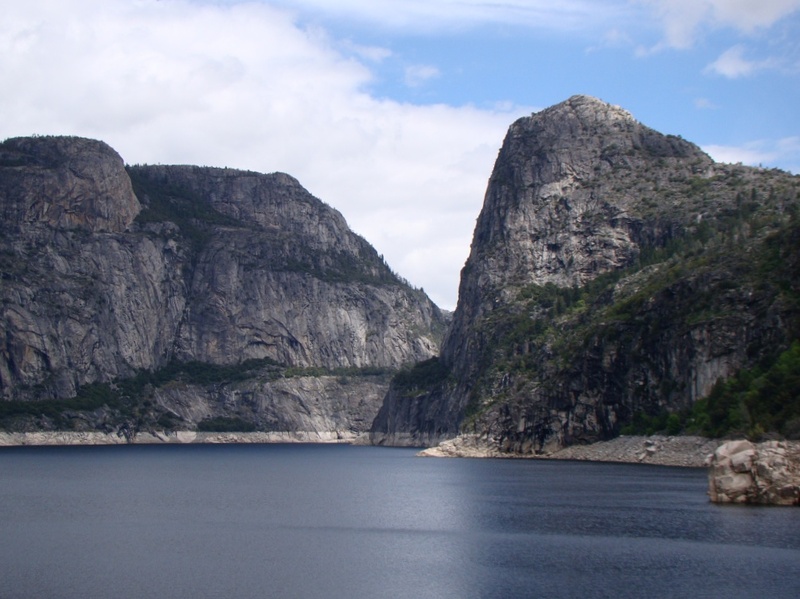 Some may not be familiar with the history of Hetch Hetchy and the fight over the dam, so here is a brief synopsis. Yosemite was one of the earliest national parks (1890) in the United States, but it was a quarter of century before there was a National Park Service, and a quarter of a century before there was a mission of the park service to "...conserve the scenery and the natural and historic objects and the wild life therein and to provide for the enjoyment of the same in such manner and by such means as will leave them unimpaired for the enjoyment of future generations". 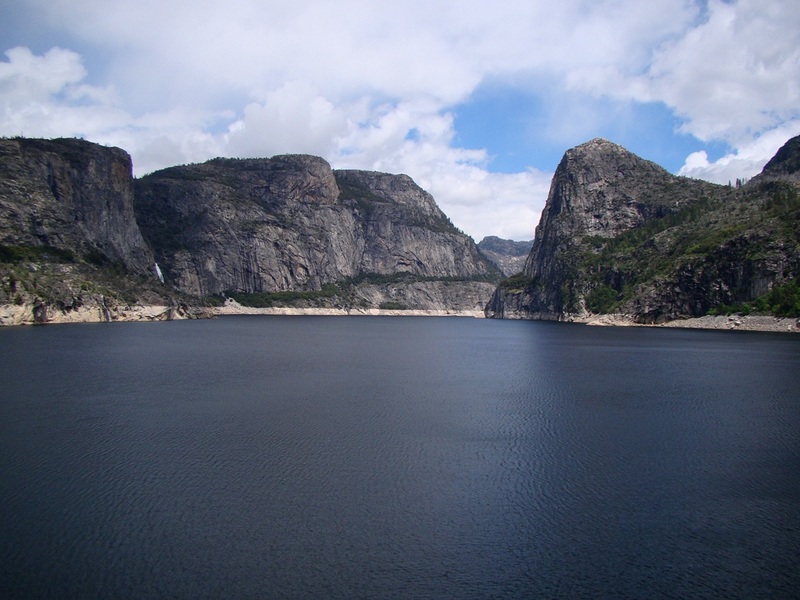 The idea of building a reservoir in a national park was not considered unusual, but the choice of San Francisco to build the dam at Hetch Hetchy was very controversial. The valley was like a second Yosemite, only more open, with wide meadows and a larger river (the Tuolumne) flowing through. John Muir and the Sierra Club fought an epic battle for 10 years after the dam was proposed in 1903, but eventually the battle was lost, and construction began. O'Shaughnessy Dam stands 312 feet high and 910 feet across, holding back more than a third of a million acre-feet. It serves the water needs of at least 2.4 million people in San Francisco and the Bay Area. I guess I won't go into great detail about my feelings about this dam, but can say that the arguments of a century ago ring true ever more strongly today as the wild places continue to disappear. There continue to be proposals to remove the dam, but the bathtub ring of barren rock would persist for centuries, perhaps as a symbol to our lack of foresight. It would be many decades before any forests could grow, but there is an argument to leave something for future generations. The mention of Kings Canyon in the comments deserves a note. Sequoia was made a national park in 1890, and Kings Canyon was made a national park 50 years later. 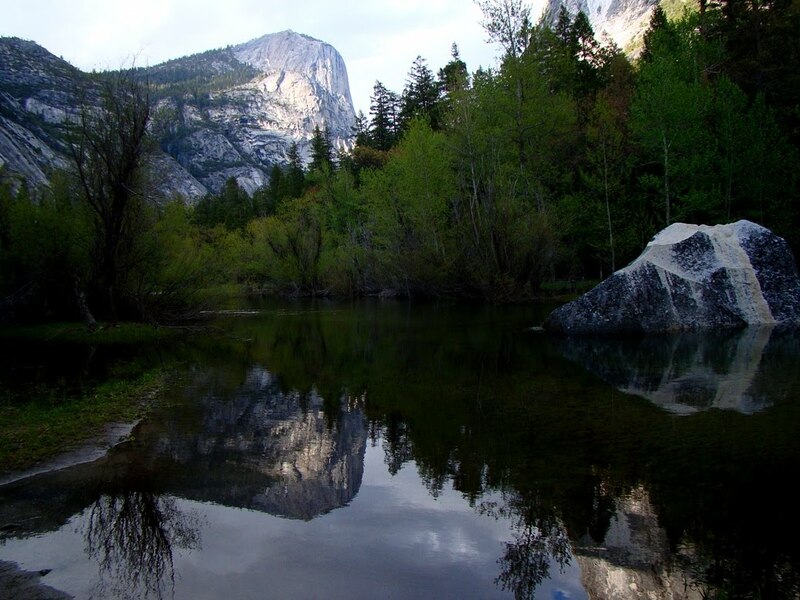 By 1940, the idea of building a dam in a national park was unthinkable...so Congress, in their wisdom, left beautiful Yosemite-like Cedar Grove and equally spectacular Tehipite Valley outside the park like a political gerrymander boundary. The intention was to legally build reservoirs there. 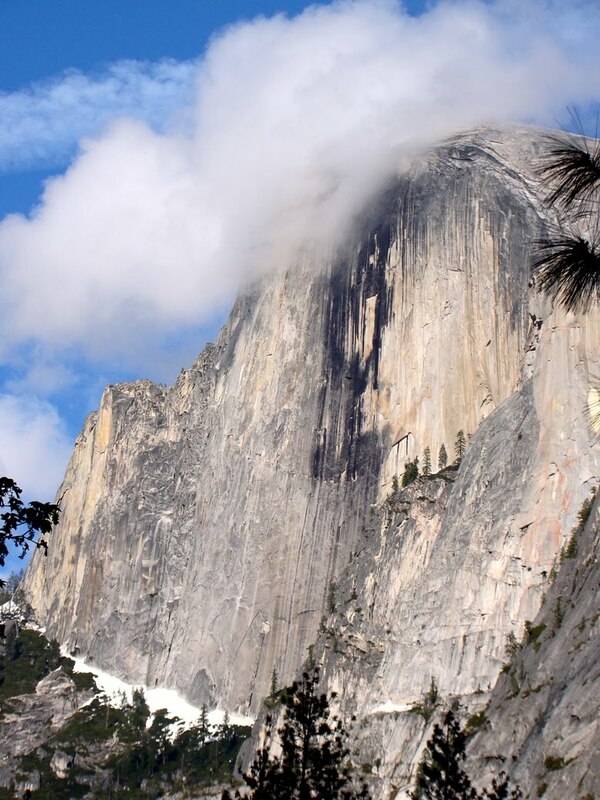 These two incredible places were finally added to the national park in 1965. 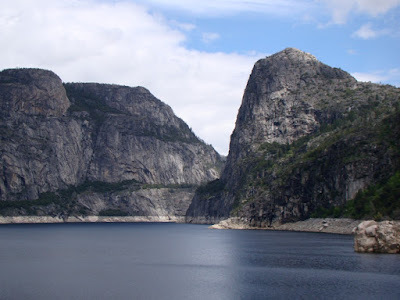 Hetch Hetchy remains a fascinating place to visit. 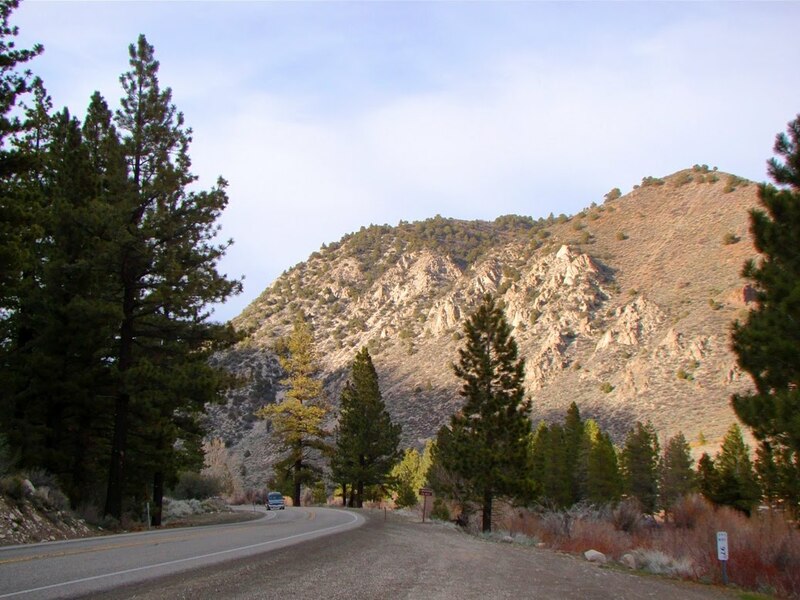 The 14 mile access road begins near the Big Oak Flat entrance on Highway 120, and winds through beautiful forests and meadowlands. 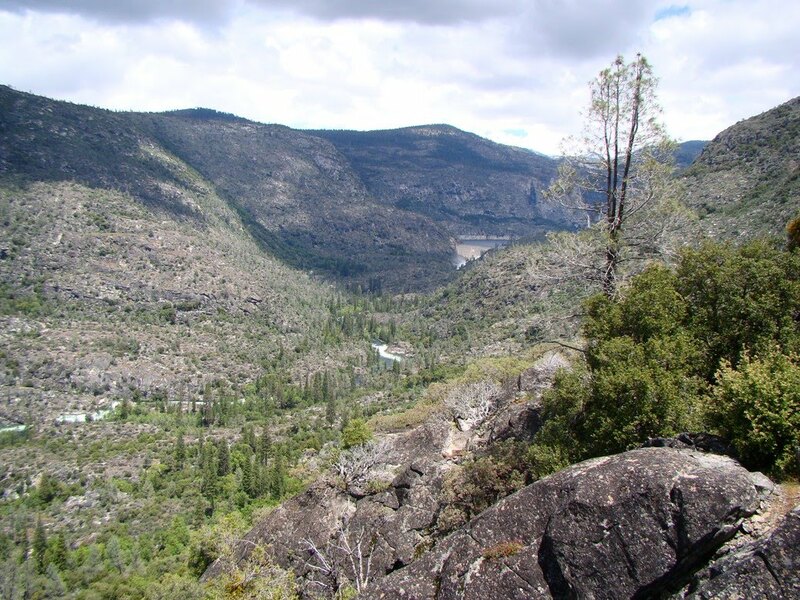 About seven miles in, the road rounds a bend and suddenly the full extent and depth of the Tuolumne River Gorge becomes visible. That flat meadowy area in the above picture is Poopenaut Valley, which recalls in a small way the original floor of Hetch Hetchy. It is reached by a tough mile-long trail that drops 1,250 feet. The remainder of the road follows the old construction railway along the cliff tops, and ends in a loop that includes a small backpacker's campground, picnic area, and a parking lot for day-use visitors (this section of the park closes at 8:00 PM). A number of trails, both short and long, start at or near road's end. A nice day hike winds under Tueeulala Falls (somewhere between 800-1200 feet high), and then literally under Wapama Falls (somewhere between 1,300-1,700 feet high). The hike is best in the spring, as the falls dry up quickly later in the year. 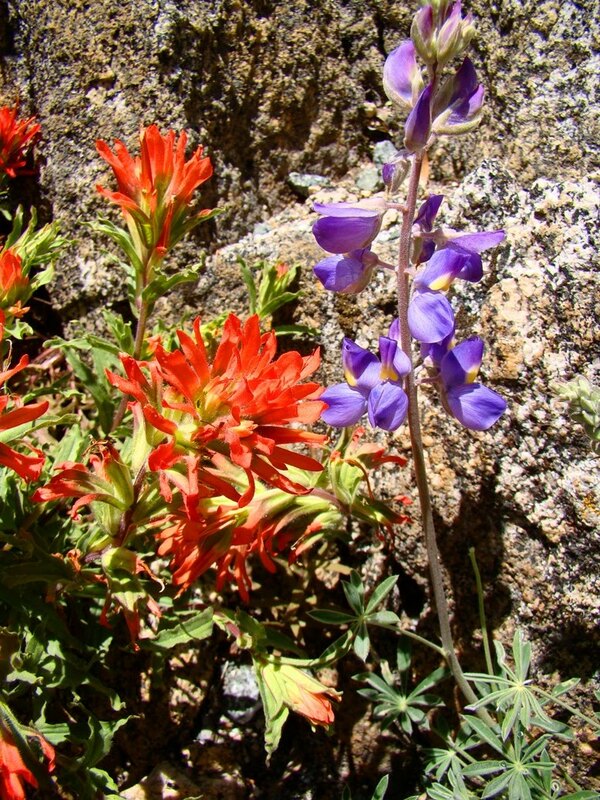 The region is a great place for wildflowers, a few pictures of which will come in another post. The "Other California" is my continuing web series highlighting the geologically interesting places in the state that don't always show up on the postcards. Yosemite Valley is famous for many things, not the least of which is huge crowds, all taking in the iconic views and recording millions if not billions of images. And that's just me. So I've found myself constantly trying to do something different, and one thing I've learned is that everyone goes to dinner and then to bed by 9 or 10 PM. 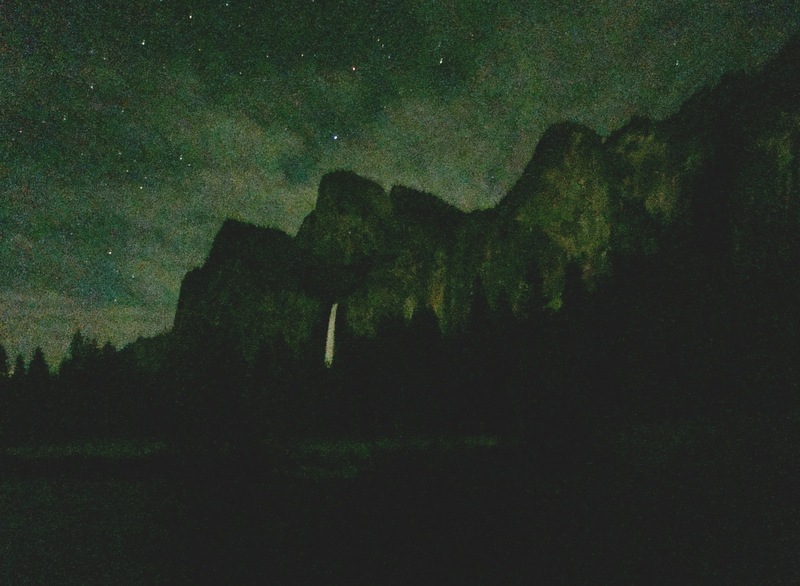 On a day that was indeed very crowded, we hung around until nightfall, and first walked up to Lower Yosemite Falls. There were a grand total of 8 other people that we saw in an hour. We had the waterfall to ourselves and it was beautiful, and all the more striking when the increasing darkness took away the visual sense, but heightened the others. The roar of the spring runoff is almost frightening in its intensity. Yesterday's post is not forgotten. I'll try to fill you in shortly! It's "Where am I Wednesday"! I Want To Go To Yosemite! A Few Friday Fun Fotos: A Fluvial Forest?